George Sten & Co Criminal Lawyers have over 50 years of experience in appearing in a range of criminal matters in the Downing Centre Local and District Court. Our criminal law specialists retain expertise in criminal law and can assist you at any point in your matter. A large majority of criminal offences in Sydney are heard in the Downing Centre, being Sydney’s busiest court complex. Adult criminal proceedings are commenced in the Local Court. Proceedings heard in the Local Court include committal hearings and prosecutions for summary offences as well as indictable offences dealt with summarily. Examples of cases that are heard in the Local Court include drink driving, assaults, AVO matters and drug possession and supply offences. The Local Court can also hear certain Commonwealth matters such as tax fraud, importation of drugs and social security offences. A summary offence refers generally to a less serious offence. Summary offences in New South Wales have a maximum penalty of two years imprisonment. These types of offences are strictly dealt with in the Local Court. Where a defendant does not have legal advice and the matter is in court for the first time, it may be adjourned to a later date for the defendant to obtain legal advice. To ensure your matter is fairly processed, you should always obtain quality and qualified legal advice. George Sten & Co Criminal Lawyers can advise you on the most appropriate steps to take in regards to your matter and will prepare a legal strategy to ensure due process is observed and you are properly defended. Where a person is convicted of a criminal offence, the consequences are extremely serious. A court may impose a penalty including a fine, a community service order or a prison sentence. In addition to this, the conviction will appear on your criminal record. A criminal conviction automatically reduces employment prospects and the ability to travel to certain destinations overseas. If you have been charged with an offence, it does not necessarily mean you will be convicted. The criminal defence specialists at George Sten & Co Criminal Lawyers can advise you on the appropriate steps to take to ensure the best possible outcome is achieved. With a proper defence, a charge may be dropped due to insufficient evidence, or no conviction recorded in an appropriate case. The criminal defence specialists at George Sten & Co Criminal Lawyers can assist you in any criminal matter in the Local or District Court at any point in the case. It is never too late to obtain legal advice and representation. An indictable offence generally refers to a more serious offence which requires a trial by judge and jury. These types of offences may be dealt with in the District Court or in the case of the most serious matters, in the Supreme Court. Examples of strictly indictable offences heard in the Supreme Court include murder, manslaughter and serious drug offences. Where a matter involves a summary offence and the defendant wishes to plead guilty, it will normally go before a Magistrate on the same day. If a defendant wishes to plead not guilty, the case will usually be adjourned for 6 weeks in which time the prosecution is required to prepare and serve the ‘brief of evidence’. This includes the evidence the prosecution will rely on to prove the charge. Every offence is made up of certain elements and with every offence these elements are required to be proved by the prosecution. The prosecution will attempt to prove the charge(s) relying on the evidence in the brief. George Sten & Co Criminal Lawyers can give you accurate and sound advice in relation to your case as well as advise on the prospects of success where applicable. Our specialist criminal defence lawyers have the skills and experience to ensure the most favourable outcome possible is achieved for you. This may mean a charge is dropped or downgraded, or thrown out of court if the case proceeds to a defended hearing or jury trial. With every criminal charge, there is strict procedure which must be followed for the prosecution to successfully convict and sentence a person. Unless this procedure is properly followed, the police and prosecution risk having the charge dropped or thrown out of court. It is not an uncommon occurrence that the procedure police are required to follow is breached leading to a person being unfairly charged with an offence which proceeds to a court hearing, and, without proper legal representation, they may be unfairly convicted of an offence and receive a sentence. Judges and magistrates do not take kindly where procedure is not properly followed and for this reason it is essential that an expert criminal defence lawyer is able to review your case and see whether there is room to show the court that the case against you should not proceed or you have a legitimate defense to rely on. An example of a situation which may lead to a charge being dropped or thrown out of court includes where an unlawful search is conducted on a person or vehicle and a prohibited substance is located as a result. Police do not have unequivocal power to stop, detain and search any member of the public without their consent. Certain circumstances at law must exist before a lawful search may be conducted on a person or vehicle. In the event a search is conducted on a person without the requisite legal grounds and without the consent of that person, any evidence, such as a prohibited substance, becomes inadmissible evidence which cannot be used to prove an offence. Therefore, if the police and prosecution only have inadmissible evidence that a person has committed an offence, the case will be dropped or thrown out of court. The criminal law specialists at George Sten & Co Criminal Lawyers know the best steps to take in any criminal case and can bring decades of experience and expertise in defending you. For further information, please contact us on (02) 9261 8640 or email us at georgesten@criminal-lawyer.com.au. 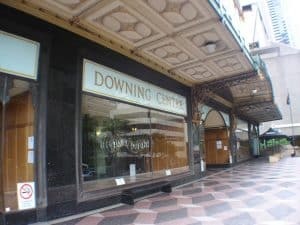 We are conveniently located within a short walk of the Downing Centre.